The services of a personal trip guide are standard on the 2007 Buick LaCrosse with the addition of OnStar’s Directions & Connections Plan with Turn-by-Turn Navigation. Buick’s premium midsize sedan also includes a tire-pressure monitoring system standard on all trim levels for greater convenience and peace of mind. Inside the ’07 LaCrosse, front occupants will ride in luxury on heated seats now available with cloth and leather upholstery. The vehicle also features new, sportier cluster graphics with red pointer gauges, Harvest Burl wood trim, steering wheel with tri-shield emblem and two new choices for cloth seat fabric – gray and neutral. Additional changes on 2007 models include a leather-wrapped shift knob replaces wood on the CXS model. Also, the 17-inch eight-spoke chrome wheels are now available on the CXL and CXS models. Customers have a choice of four new exterior colors: Midnight Blue Metallic, Stone Gray Metallic, Midnight Amethyst Metallic and Red Jewel Tintcoat. Among LaCrosse’s available features, the Comfort and Convenience Package available on CX models includes factory-installed remote start with a range of almost 500 feet and remote interior climate control adjustment , multi-language driver information center, dual-zone automatic air conditioning, a theft-deterrent system, steering wheel-mounted radio, tilt and telescopic steering column, visor-mounted illuminated vanity mirrors and a cargo convenience net. LaCrosse’s Driver Confidence Package, available on all CXL and CXS models, features steering wheel-mounted radio, a universal transmitter, electrochromic inside rearview mirror, dual heated and power-operated outside rearview mirrors, six-way power adjustable front passenger seat, Ultrasonic Rear Parking Assist, rear passenger interior reading lamps, and telescoping steering column standard on CXS. LaCrosse is offered with two powertrains. The CX and CXL are powered by one of the most renowned engines in GM’s lineup, the 3.8L V-6, now in Series III form. Rated at 200 horsepower (149 kW), the 3.8L features electronic throttle control to improve engine response and optimize fuel efficiency, along with upgrades for quiet operation. The performance-oriented LaCrosse CXS has a standard 3.6L V-6 VVT (variable valve timing) that delivers 240 horsepower (179 kW). The premium, all-aluminum engine features dual overhead camshafts and four valves per cylinder. Its fully variable intake and exhaust valve timing achieves outstanding flexibility, delivering 90 percent of the engine's peak torque where it is most useful, between 1500 rpm and 6000 rpm. The 3.6L VVT delivers a market-leading balance of good specific output, high torque over a broad rpm band, fuel economy and first-rate noise vibration and harshness control. LaCrosse delivers a smooth, quiet and controlled ride. A sport-tuned suspension, standard on CXS, has larger stabilizer bars for more responsive handling characteristics. LaCrosse is offered with three levels of traction control, including GM’s StabiliTrak electronic stability control system that helps the driver maintain control during sudden maneuvers or in low traction conditions by applying brake force at any corner of the vehicle independent of the driver’s use of the brake pedal. The system also uses an accelerator pedal position sensor, brake master cylinder pressure sensor and steering wheel angle sensor to interpret the driver’s desired path, and whether to accelerate or decelerate the vehicle. Integrated with traction control and ABS systems, StabiliTrak uses these sensors plus a lateral accelerometer and yaw rate sensor to determine the vehicle’s actual path. In addition, the tranquil ride is made possible by Buick’s QuietTuning, an all-encompassing engineering approach aimed at reducing, blocking and absorbing unwanted road, wind and powertrain noise from entering the vehicle’s cabin to provide leading levels of interior quietness. Specific examples include the use of acoustical laminate on the windshield and front side glass; steel laminate on the front-of-dash body area; expanded baffles in the roof pillars; extensive use of melt-on sound deadeners throughout the entire lower body structure; a re-tuned exhaust system; and sound-absorbing material throughout LaCrosse’s engine, passenger and cargo compartments. 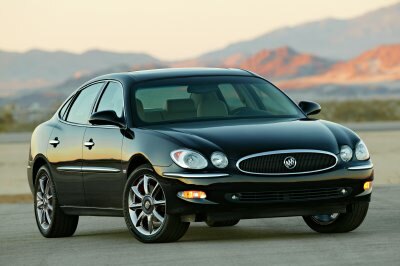 LaCrosse’s sleek, sculpted body is classic Buick design. Precision body panel fits and a tight fender-to-tire relationship underscore LaCrosse’s high quality engineering and provide an agile appearance. Chrome accents and the jewel-like design of the headlamps and taillamps add touches of elegance. Buick’s focus on creating a highly crafted, attention-to-detail appearance is reflected in LaCrosse’s interior. Its clean, ergonomic design makes use of high-quality soft-touch materials, as well as tasteful chrome and woodgrain accents. The overall effect is an environment that is both elegant and comfortable, with close attention paid to component fits for a precision feel throughout. LaCrosse is available in either five- or six-passenger seating configurations. A 110.5-inch wheelbase gives LaCrosse spacious rear legroom. Front and rear hip room is a spacious 55.3 inches and 54.6 inches respectively. Five-passenger models are equipped with a wide center armrest with a deep storage area and a console-mounted gearshift lever. Six-passenger models have a column-mounted shifter and feature a “flip and fold” seatback cushion that can be converted into a spacious center console/armrest with a large storage bin and dual cup holders. In keeping with LaCrosse’s position as a premium sedan, standard features on all models include remote keyless entry, a power driver’s seat, automatic programmable power door locks with lockout protection, power windows with express-down driver’s window, six-speaker stereo radio with CD player, and full interior illumination with delayed entry/exit lighting and theater-style dimming. Available comfort and convenience items include a power sliding sunroof; heated front seats; steering-wheel-mounted audio and climate controls; and stereo system upgrades such as in-dash six-disc CD changer, MP3 player, Concert Sound III and XM Satellite Radio (continental U.S. only). XM provides more than 120 coast-to-coast, digital-quality channels of original commercial-free music and premier news, sports and talk as well as advanced traffic and weather information for select major metropolitan areas nationwide. Consumers can subscribe to the basic service for $12.95 a month. The LaCrosse is built with a strong “safety cage” structure and a full-perimeter aluminum engine cradle that directs impact energy away from passengers. Lacrosse also features standard anti-lock brakes and side curtain air bags on all models. Dual-stage frontal air bags provide supplemental protection and help reduce the risk of air bag-induced injury. When the air bag system’s control unit detects an impact, it determines whether the crash is severe enough to trigger a deployment, and whether the primary amount of inflation is sufficient. The primary stage alone will deploy in most frontal impacts requiring the supplemental protection of an air bag, while a secondary stage is designed to deploy in more severe frontal collisions. The OnStar service standard on the 2007 LaCrosse includes General Motors Advanced Automatic Crash Notification (AACN) system, making crash data available to the participating 911 centers to help them dispatch the appropriate life-saving personnel and equipment to crash scenes faster. OnStar features dual-mode (analog-digital) equipment and includes enhanced hands-free voice recognition capabilities to provide more intuitive continuous digit dialing and improved voice recognition accuracy. Using the GPS satellite network and wireless technology, OnStar features core safety services and OnStar Hands-Free Calling that allows drivers to make and receive voice-activated phone calls using an externally mounted antenna for greater reception. Other security and convenience features include a standard PASSLock III theft deterrent system with engine immobilizer; and Ultrasonic Rear Parking Assist, which detects stationary objects behind the vehicle and sounds a warning when the vehicle is being backed up.